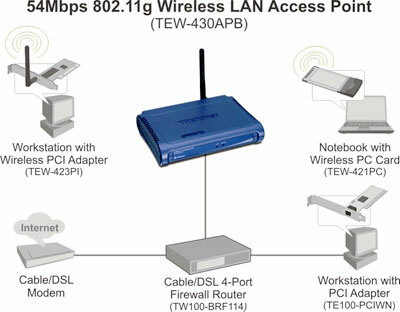 PTN-TEW-430APB Wireless Access Point is compliant with the IEEE Wireless Networking Standard 802.11g. It provides Direct Sequence Spread Spectrum (DSSS) operation for transparent bridging and roaming capabilities for wireless nodes. The PTN-TEW-430APB also provides WDS bridging functions, allowing users to connect two or more Access Points together, wirelessly. With this Wireless Access Point and Wireless Network Adapters, users can connect to Ethernet/Fast Ethernet LAN at home or office to access network resources with coverage up to 300 meters.